Highly skilled manufacturers of quality Wire Mesh and Tubular products based right here in Manchester. Browse through our web pages and view just some of our standard range of best selling products including Wire Mesh Lockers and Storage Units, Display products, Point of Sale and Safety Guards, which we sell throughout the UK and Europe. 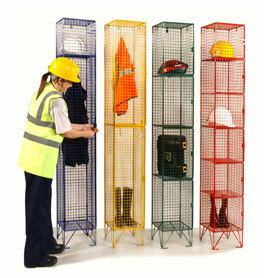 See how we can create the perfect solution to your storage, display and guarding issues. Call us today and we will go through all your requirements and provide you with the expertise and knowledge to produce that exclusive specialised product you need on time & within budget.